Louis Brandeis was an American lawyer and was the first Jew to be appointed to the Supreme Court Justice in 1916. Brandeis had graduated from Harvard Law School and settled in Boston. 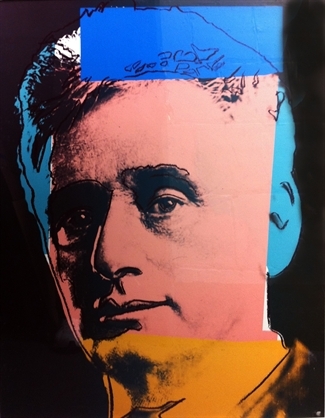 Brandeis made a name for himself by championing socially progressive issues, and became known as “the people’s attorney.” His writings on individual rights of privacy was a new concept and has had lasting impacts on American society. Brandeis later became involved in the Zionist movement. Louis is a part of Andy Warhol’s Ten Portraits of Jews of the 20th Century. Brandeis’ championing of privacy is an interesting contrast to Warhol’s fascination in pop culture’s lack there of, in celebrity. Warhol was prolific in creating portraits of celebrities and was well known for his fascination with fame. It is noted that Warhol’s portraiture tends to reveal only the surface of a subject, just their image. In this series of portraits, the type of celebrity Warhol deals with is not so glamorous or typical of his usual pick of movie or rock stars.